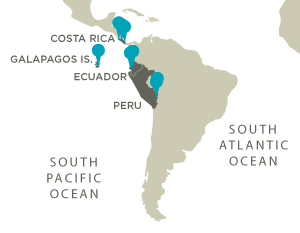 Adventure and education collide during our three-month journey through the lush jungles, dizzying heights and breathtaking coasts of Costa Rica, Peru, Ecuador and The Galapagos. 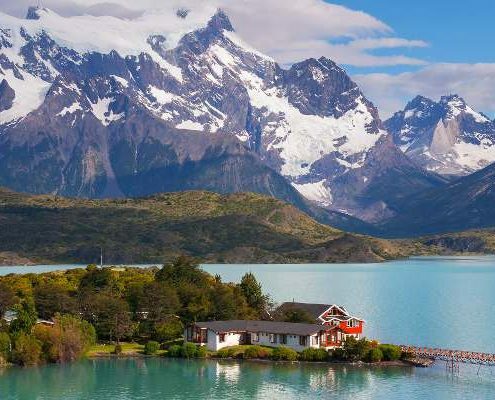 Our Latin America Gap Program takes advantage of our nearly 20 year history of exploration and service in Latin America and opens doors unimagined by the casual traveler. 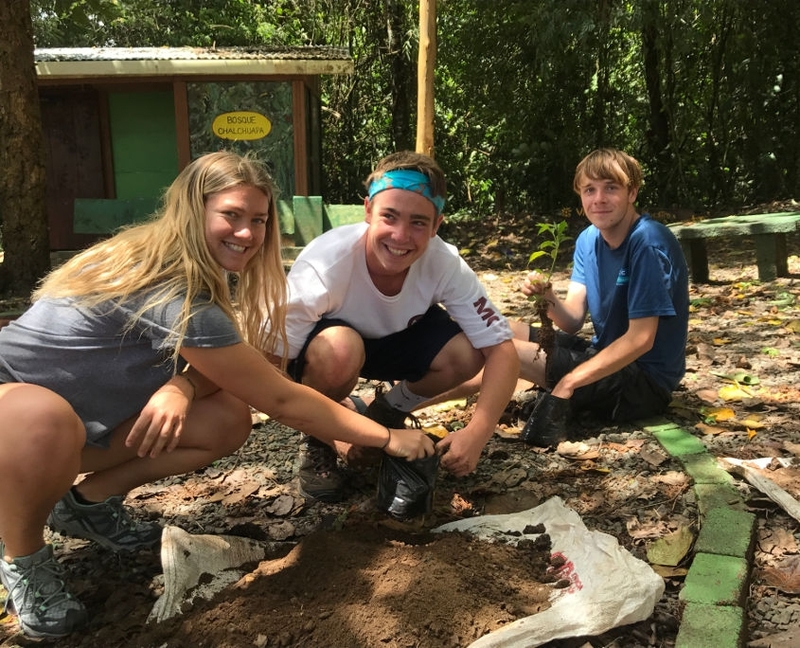 Tucked away in a remote mountain village in Costa Rica, we discover the simplicity of “pura vida” working alongside our generous hosts to improve the village’s infrastructure. Flying through the forest canopy on ziplines, the vibrancy of life in the jungle beckons to us in the calls of toucans and howler monkeys. 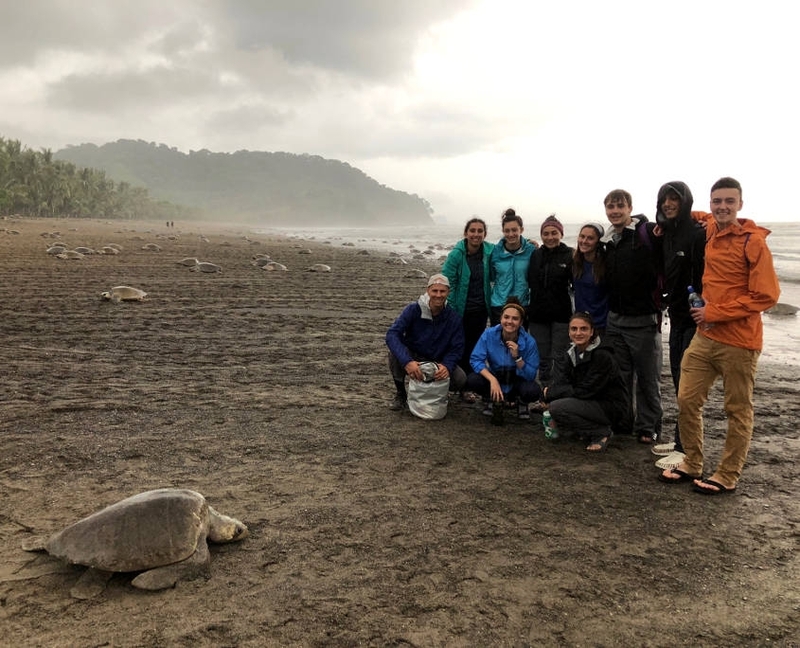 Partnering with local biologists on Costa Rica’s Pacific Coast, we work hand in hand to preserve the offspring of Olive Ridley sea turtles nesting on shore. 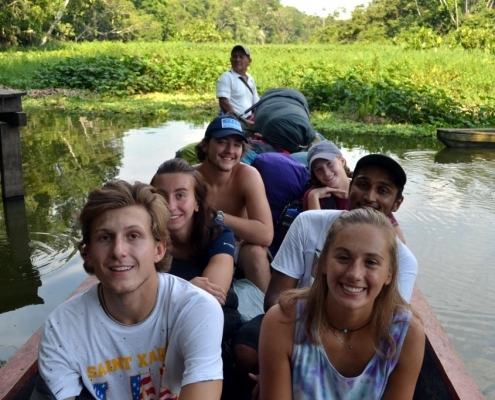 Navigating Ecuador’s Amazon jungle by canoe, we partner with a local politician to explore the effects that petroleum drilling and gold mining are having on the environment and indigenous communities. 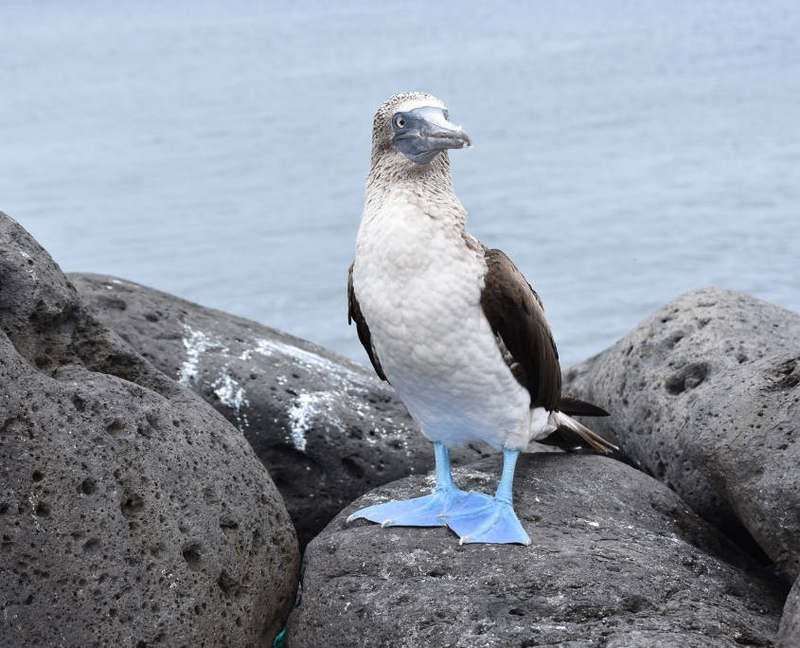 Exploring the breathtaking biodiversity of the Galapagos Islands, we swim, snorkel and mingle with prehistoric lava lizards, flamingos, blue-footed boobies, and baby sea lion pups. Treading in the footsteps of the Inca, we gain insight into an ancient culture as we explore the famous ruins of Machu Picchu in Peru. 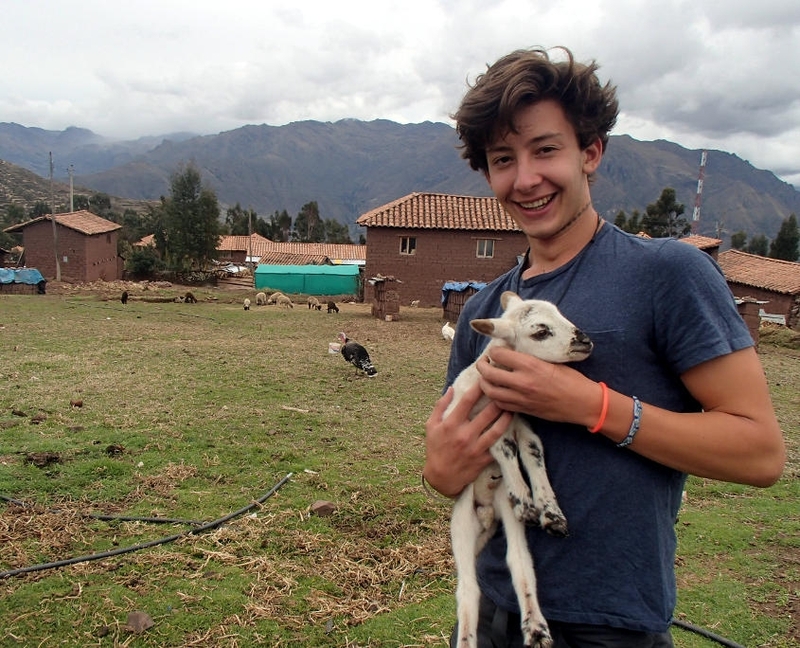 The abundance of life around us underscores the rich and unforgettable experiences of this Latin America Gap Semester. We begin our semester with a Gap orientation in the U.S. After a welcoming BBQ with all ARCC Gap programs, we settle into our Latin America group, getting to know one another and our instructors. 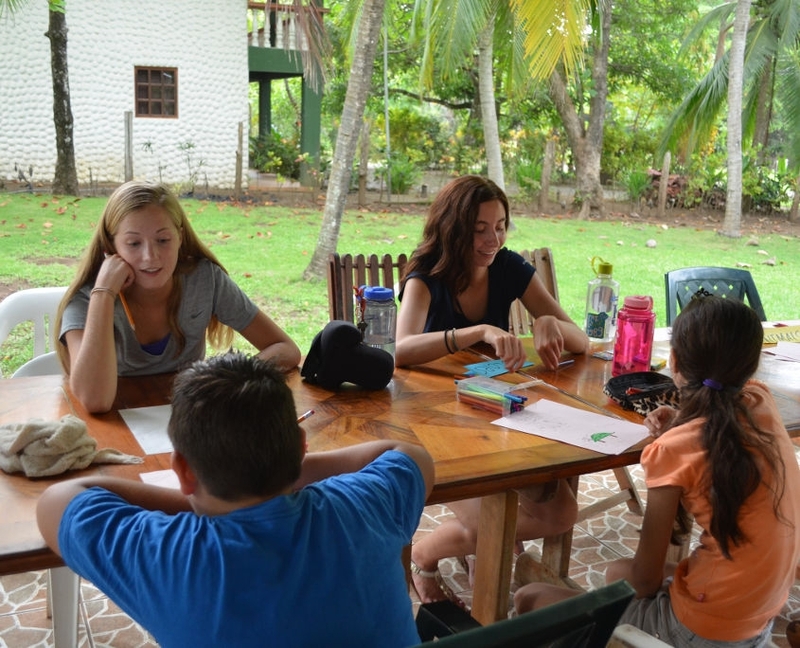 Together we map out our itinerary and set both individual and group goals for the duration of the program. We introduce our curriculum and brainstorm ideas for our individual Capstone Projects, all the while coming together as a traveling community. 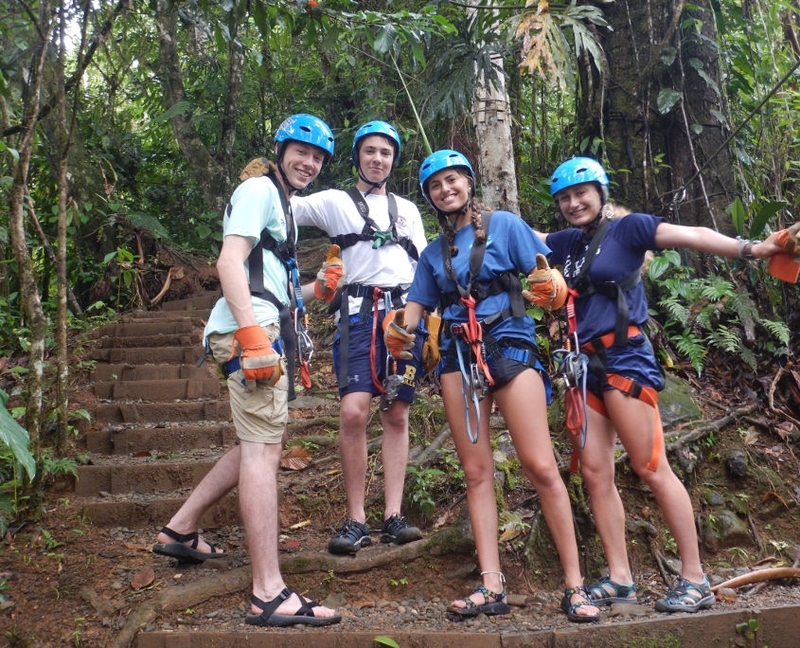 We fly together to San Jose, Costa Rica, where we are welcomed by our local partners and jump right into our in-country orientation to Costa Rican culture and customs and understanding the “pura vida” lifestyle. 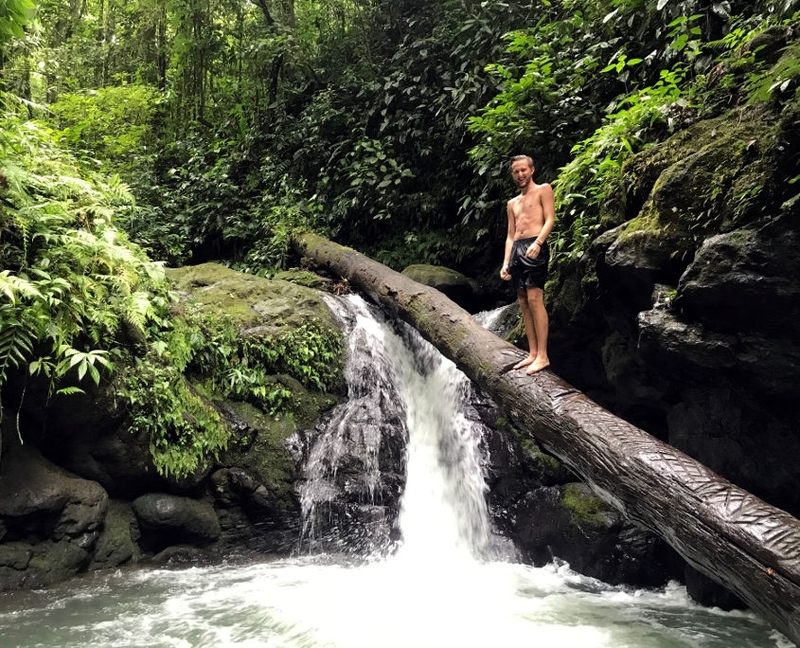 After a day exploring San Jose, we head to the world-renowned Pacuare River for two days of exploring the rainforest and navigating the river’s famous whitewater. 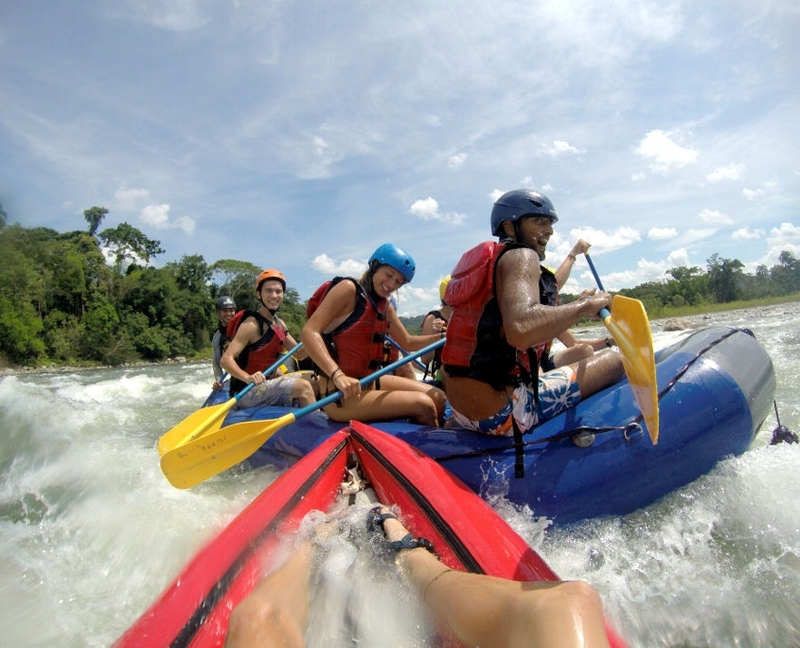 Floating our way through the pristine forest canopy, we discover hidden waterfalls and natural rock slides, all the while continuing to come together as a group. Making our home at a river lodge set back amongst the huge leaves of the Sombrilla de Pobre (“Poor Man’s Umbrella”), we use this area as a base to explore and adventure. 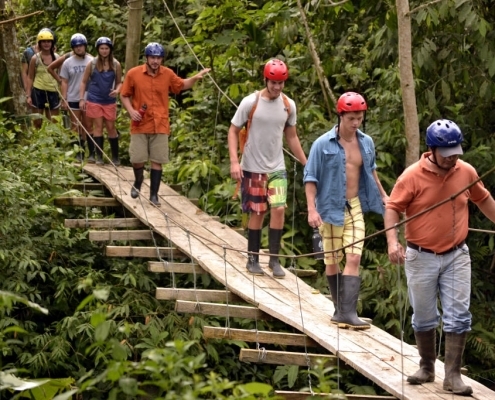 Leaving the jungle behind, we make our way to Samara, situated on the Nicoya Peninsula. 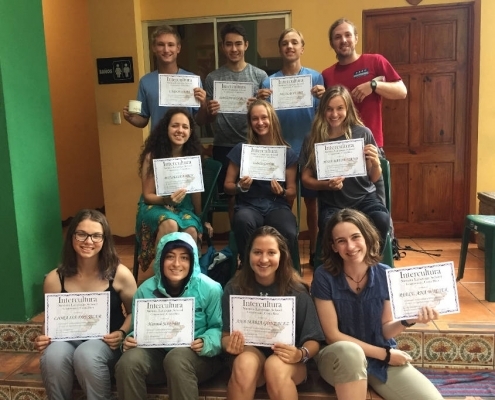 For the next week we sharpen our Spanish skills, taking classes taught by native speakers and practicing what we learn during our homestays with local families. 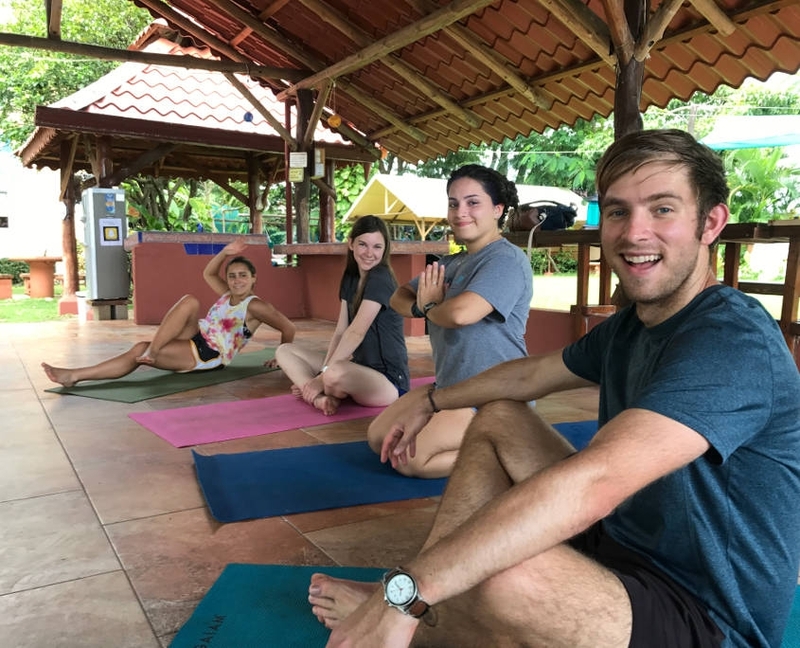 Outside the classroom, we may choose to participate in a variety of activities, such as yoga, Zumba classes, or kayaking. We continue to come together as a traveling community, refining both our individual and group goals for the semester. Our preparation includes further discussion of our curriculum, including identifying the five essential themes and where each will be addressed throughout the semester. From Samara we travel south along the Nicoya Peninsula to San Miguel where we delve into the Environment and Conservation theme with a sea turtle conservation project. Working alongside a local grassroots organization, we help monitor the nesting activity of the Olive Ridley turtles. 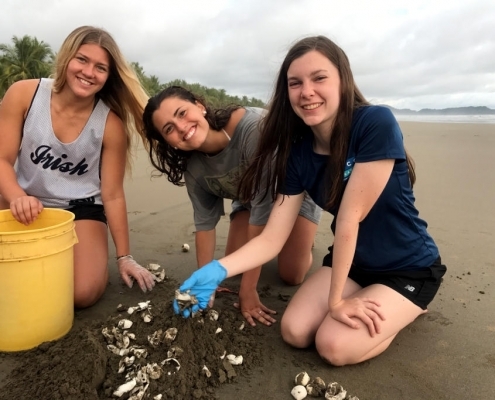 Since 1998, volunteers have protected 2,618 nests and released 129,529 baby turtles and we can only hope to do our part in the protection efforts. In addition to patrolling the beaches at night and learning about turtle conservation during the day, we participate in community outreach educating the local youth on why the importance of the Olive Ridley turtles and why these protection efforts are important. 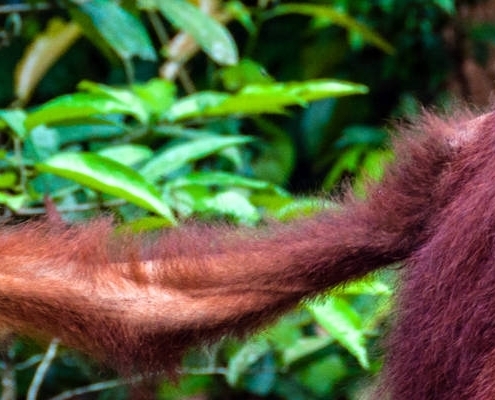 Deep in the mountains, we are welcomed into a wildlife sanctuary working diligently to rehabilitate and conserve various endangered species and rescued animals including various birds, mammals and reptiles. Settling into a homestay, we are immersed into the community and given the opportunity to compare and contrast this conservation center with the work we previously assisted in on the coast. 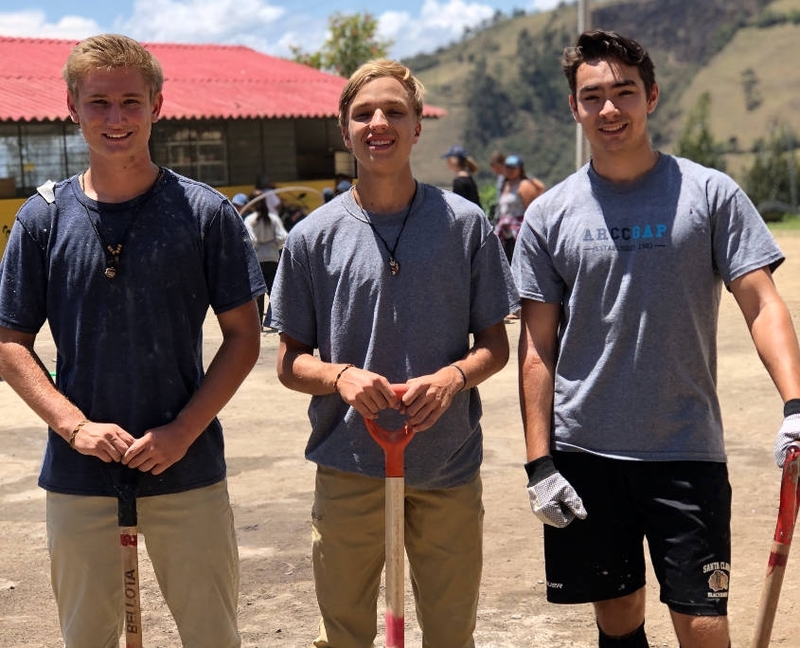 We have ample opportunity for service learning and cultural exchange, helping out with chores on the family farms, working in the organic garden, and cooking meals with our local hosts. Our primary project at the animal refuge will be assisting in the building and reparations of habitats for the rescued wildlife. 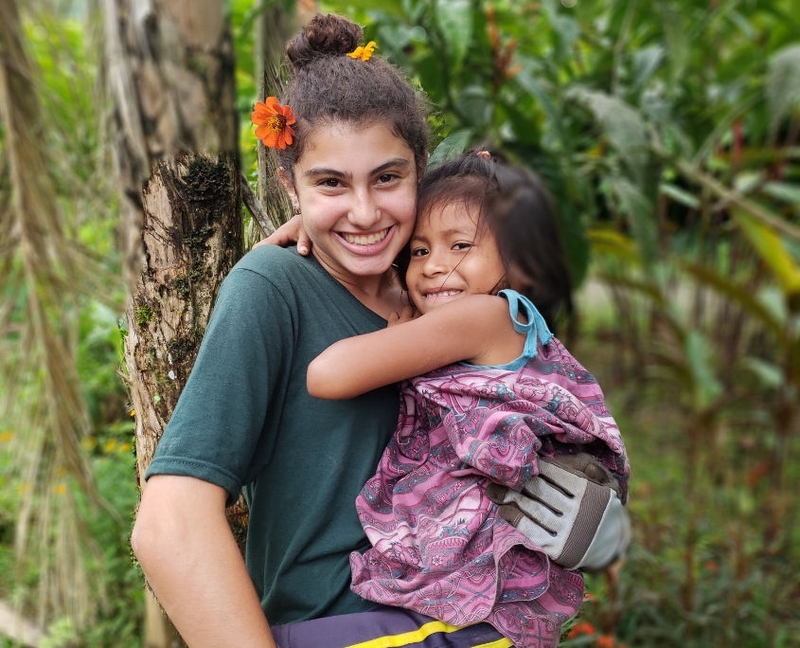 We also explore the rich rainforest surrounding the village and spend time with our new friends, playing soccer, sharing laughs, and forging bonds that will last a lifetime. For our last days in Costa Rica, we check out Costa Rica’s amazing surf breaks. 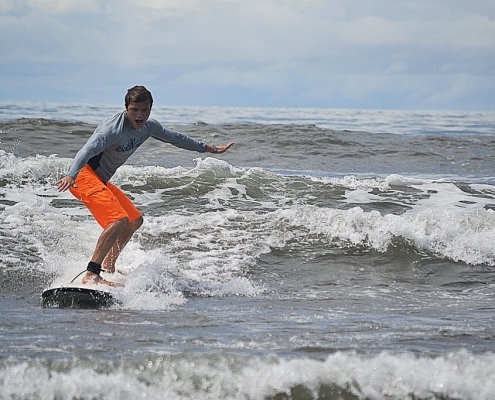 After a few lessons with local surf instructors, we feel confident catching the friendly beginner waves. At the conclusion of our time here, we return to San Jose for a final day in Costa Rica as we prepare for our next adventure in Ecuador! 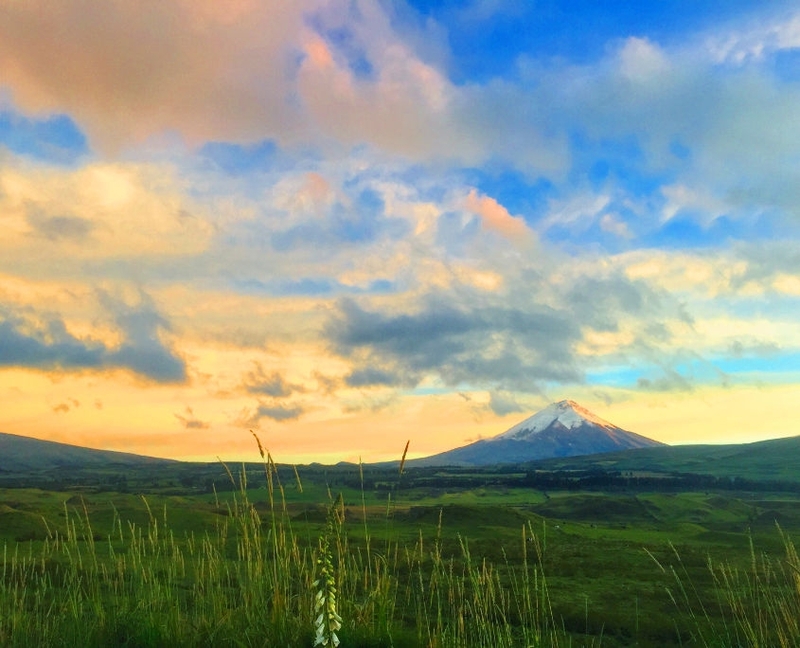 Located on the northwest corner of South America, Ecuador is a gem of diverse geography, rich cultural history and unique wildlife. 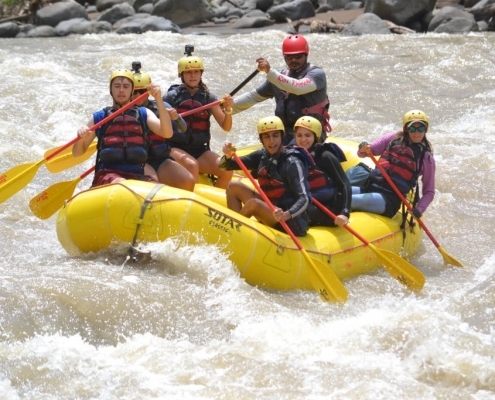 Through our travels, we quickly learn why Ecuador stands out as an environmental leader in the international community, but also discover that there is still much to be done. Upon landing in Quito, we are greeted by our Ecuadorian friends who give us a brief orientation and tour of the spectacular capital city, located over 9,000 feet above sea level and ringed by volcanoes. 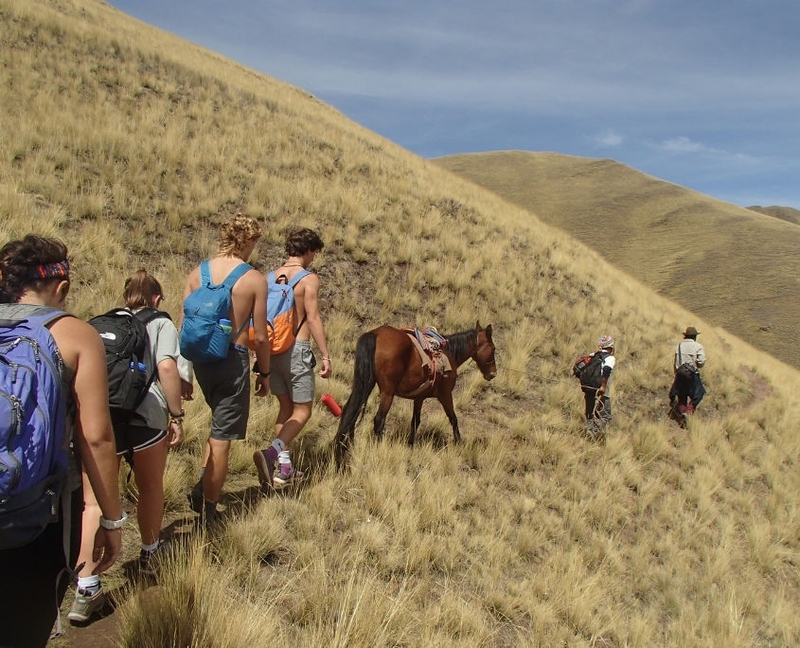 We zipline and hike through the Santa Rita Ecological Reserve and enjoy learning about Cotopaxi, the unique mountain that is a symbol of pride for the country. We visit the “Mitad del Mundo” museum located on the equator and try out the various activities that you can only do standing directly on the middle of the world, before heading into our next adventures in the Amazon Rainforest. Heading south to the Amazon rainforest we stop in Coca, where we jump right into our first project in Ecuador, studying the mining of petroleum and gold in the rainforest, and gain an understanding of the positive and negative effects it has on this part of the Ecuadorian Amazon and its communities. We visit oil derrick sites and see the groundwater and soil pollution from irresponsible water disposal. While here we have the opportunity to interview workers at the site. We also observe avian and aquatic wildlife that has survived numerous pollution events from nearby petroleum production. During this section we have an opportunity to witness what illegal mining is doing to the Amazon by way of devastating deforestation and pollution and participate in a water sampling project to see what these dredges are doing to the local water source. 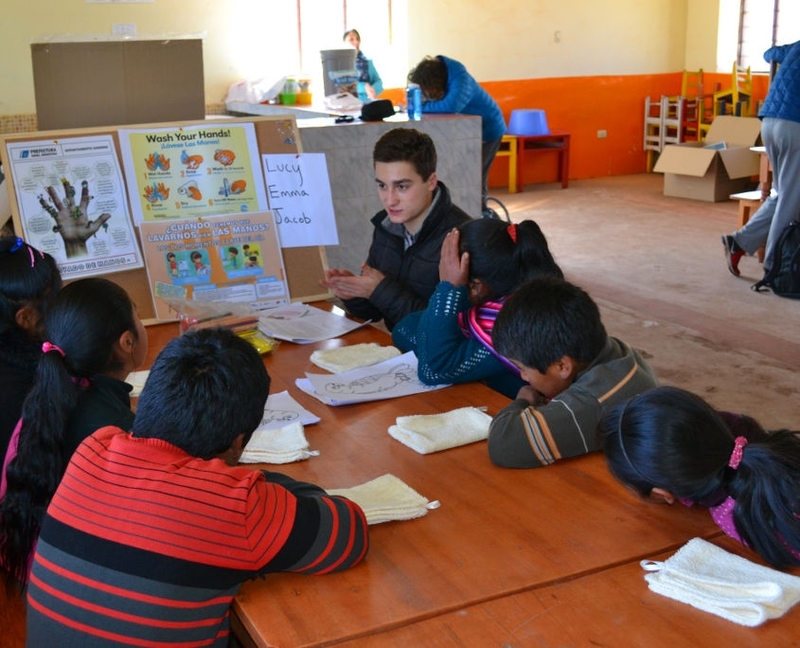 In Coca we gain familiarity with a sustainable micro-enterprise by working with local school students making fruit pulp from local organic materials. 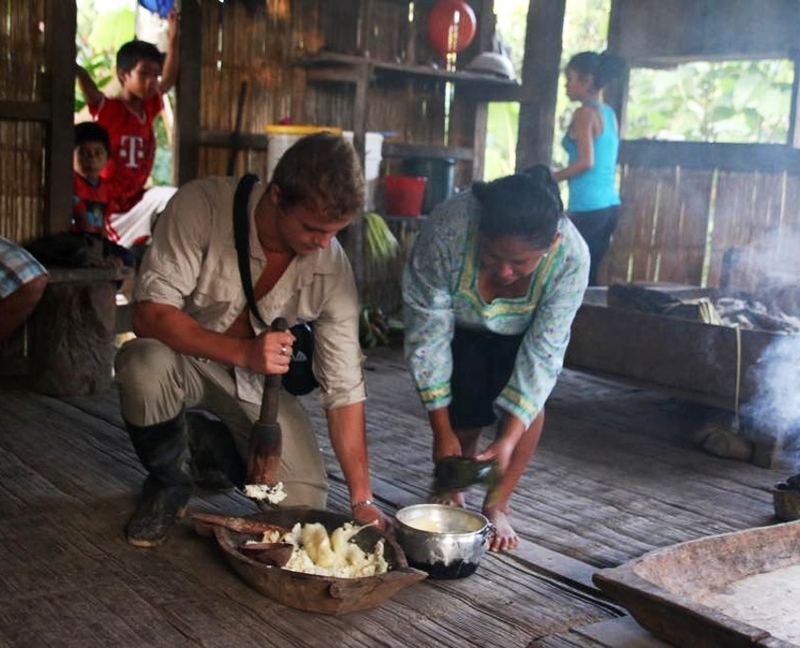 Settling into our homestays with local Kichwa families deep in the Amazon Rainforest, we begin an in-depth anthropological study of cacao growers in the Ecuadorian Amazon. Ecuador makes some of the richest, most delicious artisanal chocolate available today and we have the opportunity to examine this economic market. We not only learn how exporting chocolate upholds the local economy in the Amazon, but we work alongside the cacao growers on their farms and learn about the chocolate process from harvest to production. We also participate in a community meeting and present a short workshop on globalization and international markets. Saying a sad farewell to our gracious homestay hosts, we make our way to Tena, a bustling Amazonian town not far from Coca. We spend a day rafting the rapids of the Jatunyacu River, then we take some time to ourselves to relax, explore, and join in the local festivals and activities. After a couple days in Tena we embark on our Student Planned Module. These days are totally planned by the students, with basic parameters put in place and a budget with which to work. We cannot wait to hear what the group will do! 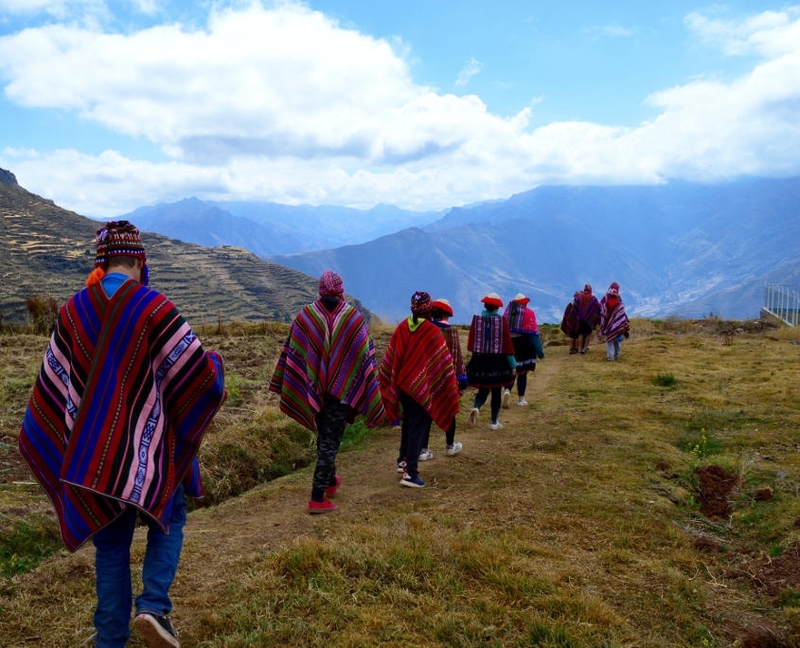 Trading the jungle lifestyle for the mainland mountains, we head north to the province of Imbabura where we are welcomed by our hosts in the Guachinguero community, a remote village in the Andes. It is a beautiful Indigenous community that looks into the valley of Otavalo. 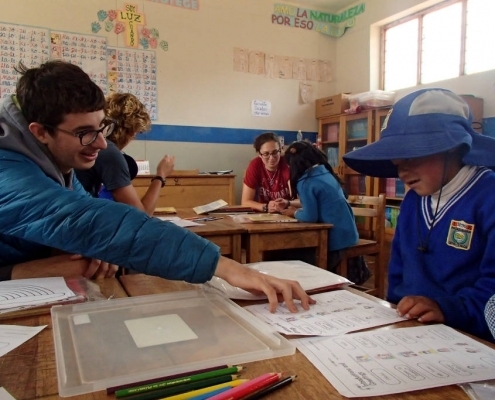 In Guachinguero, we meet with the community president to learn more about the community and its people and help with a construction project at the school. The school is a two teacher school for grades K-7 and is in the process of expanding their building by adding a second story to the house, a computer lab and office, and also a cafeteria area for the students. We jump right into this phase of the project and work alongside the community members. In the afternoons we have a chance to interview the community president and teachers about the importance and impact these improvements are going to have on the community and the students. 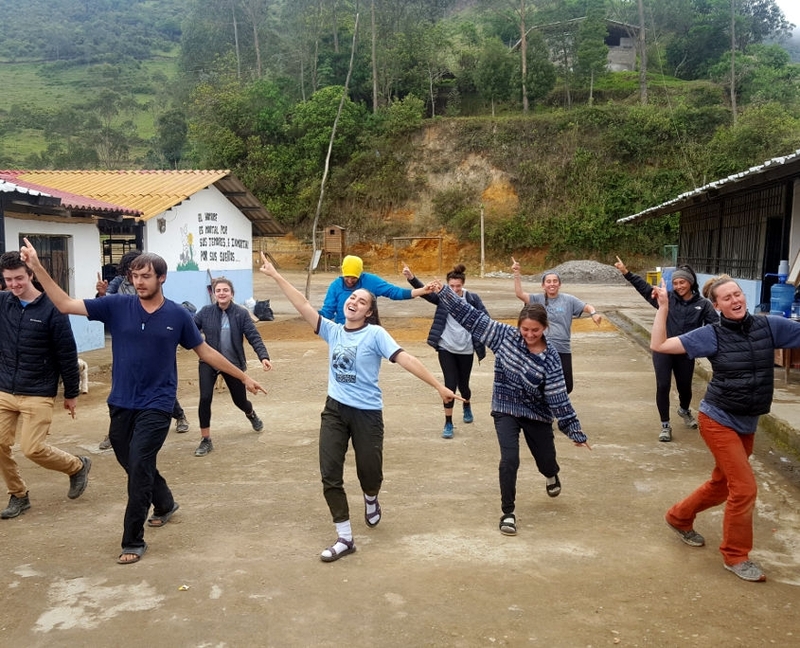 During our downtime we play soccer with the students, shop at the world-renowned Otavalo market, and explore the beautiful landscape of the surrounding area. After a farewell ceremony with the Guachinguero community, we return to Quito for our short flight to the Galapagos. 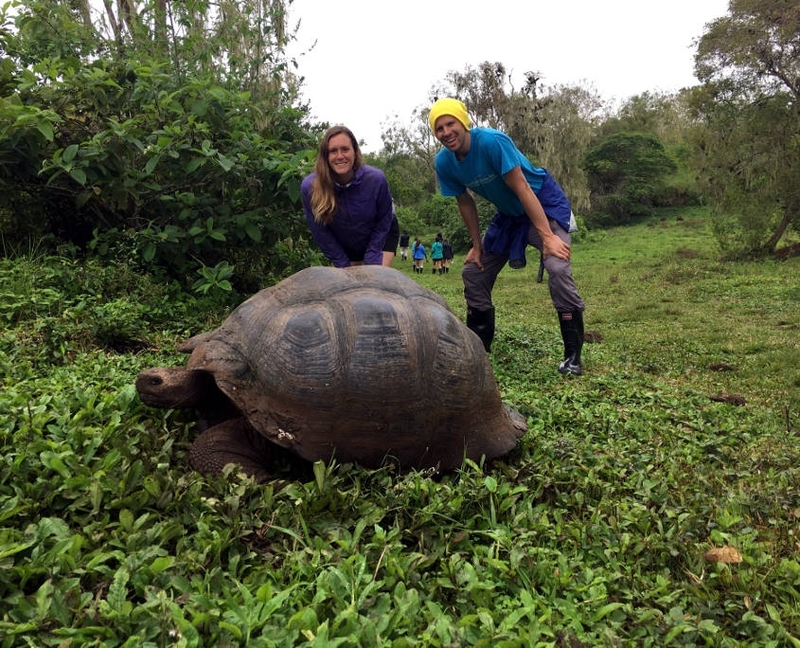 Leaving the mainland behind we hop on a plane headed for the world-renowned Galapagos Islands. This excursion guarantees an adventure of a lifetime as we have the opportunity to snorkel with some of the most unique species in the world, including prehistoric lava lizards, blue-footed boobies, flamingos, penguins and dolphins. Our evenings are spent exploring the island communities, interviewing locals about current conservation issues and their importance within this ecosystem. We visit the Charles Darwin Research Center and learn about the relevance of the islands and their biodiversity in our history. 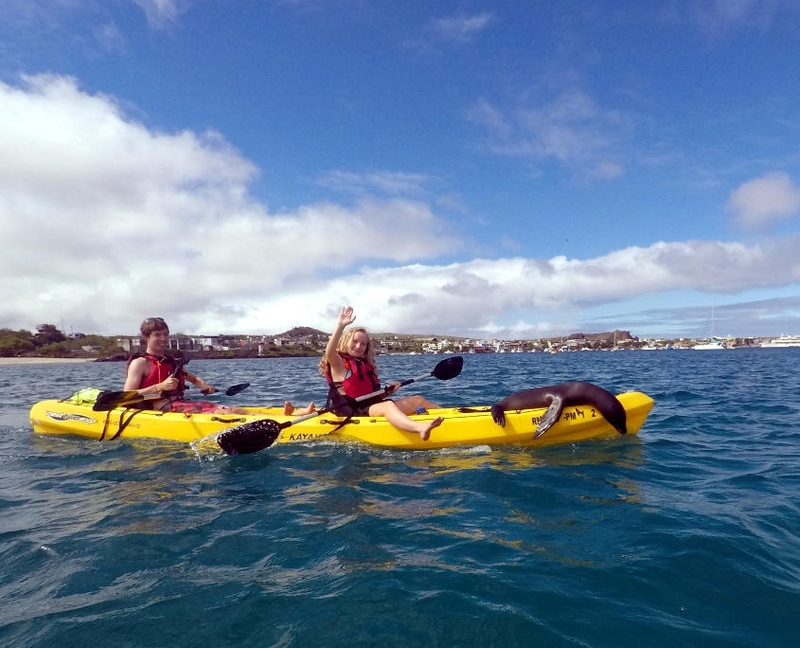 We venture out on kayaks to explore the rocky coastlines, visiting a giant tortoise breeding ground along the way, swimming with sea lions at San Cristobal, and snorkeling in the beautiful Tortuga Bay. 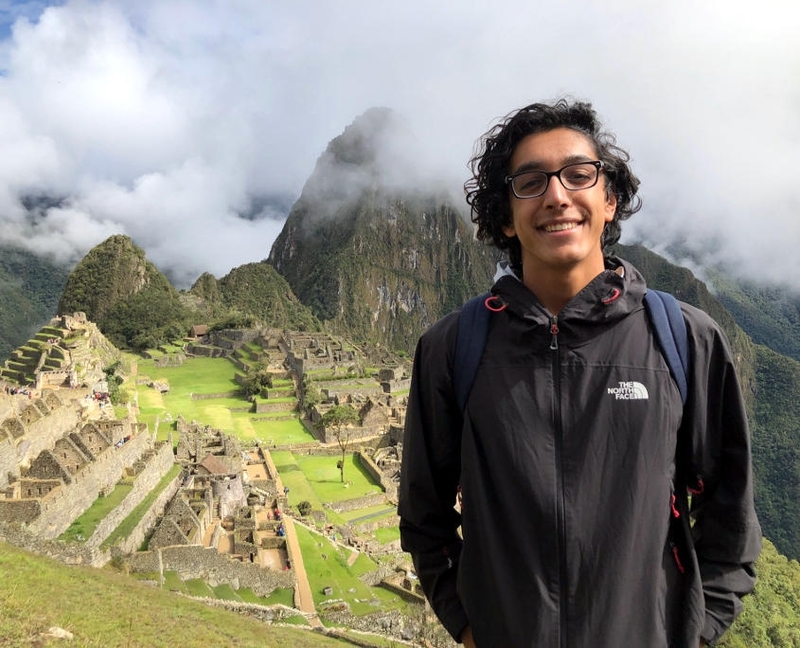 We head back to the mainland to continue on our journey through South America with Peru as our next stop, enlightened by our experiences and newfound insights from the Galapagos. 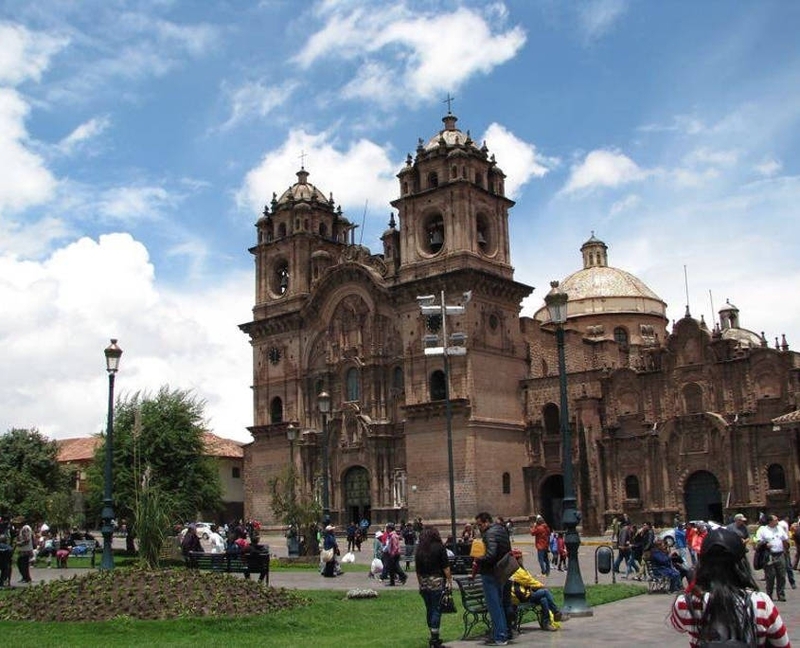 We arrive in our final country of the semester, Peru, and spend our first couple days in the charming city of Cusco, exploring colorful plazas and markets, cobblestone streets, and the Incan ruins of Sacsayhuaman scattered atop the hillside overlooking the city. 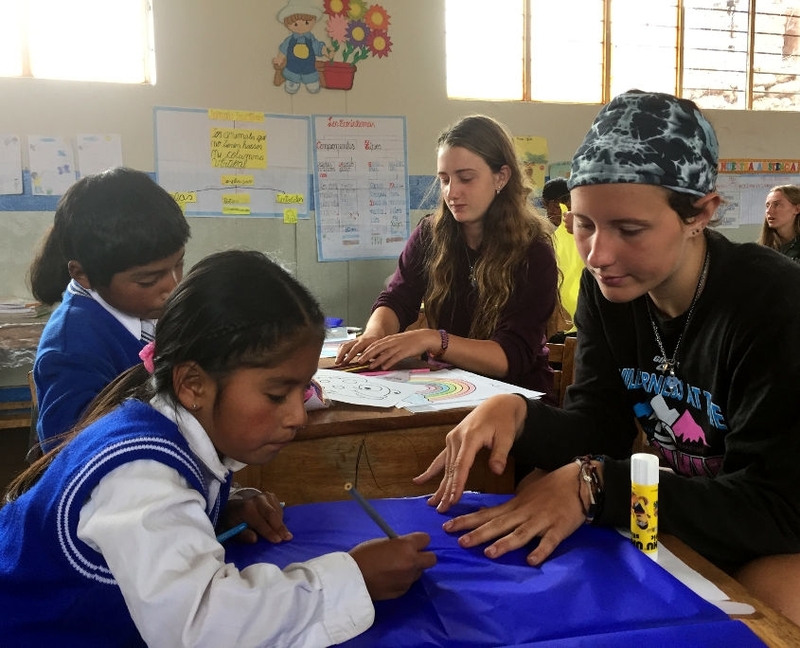 We then begin our project working with a local non-profit working to provide educational opportunities for young girls in Peru. 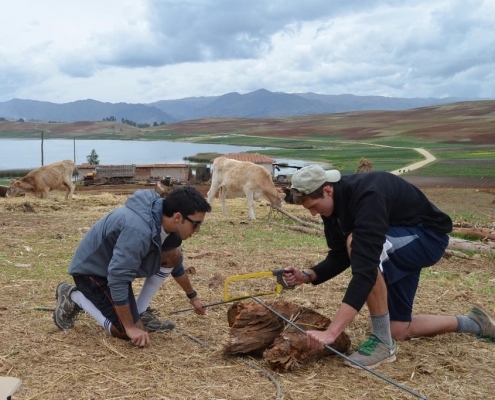 We spend a few days at a hogar in Urubamba. A hogar is a home for children, and the one we visit is specifically for young girls aged 3-18 years old. At the hogar we have the opportunity to interact with the girls, hear their stories and interview the women who run this special community. We also spend a day with young scholarship recipients who are receiving funding from this non-profit to attend university, and are often the first in their families to do so. 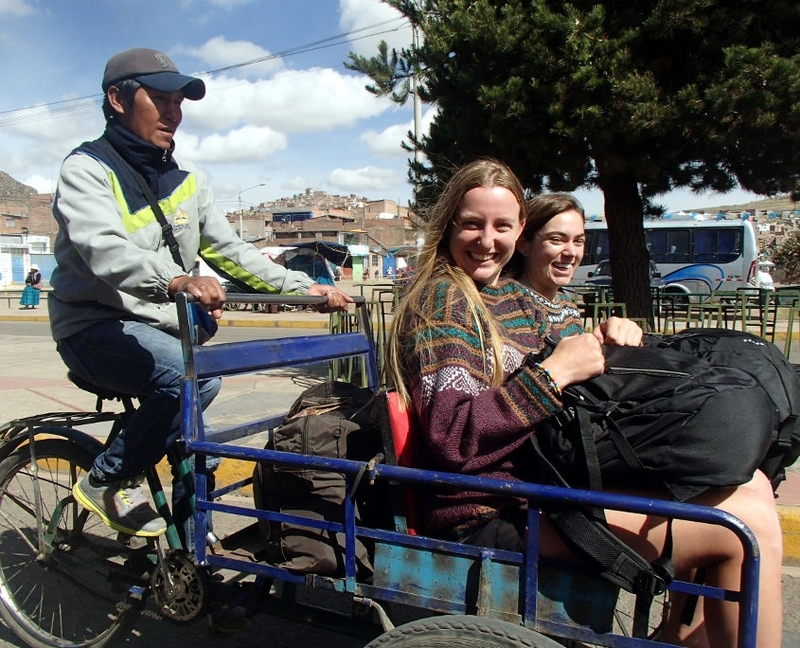 Saying a sad goodbye to our dear friends at the hogar, we spend the next two days in the beautiful Sacred Valley town of Urubamba. We may decide to participate in some cultural activities, work on our Capstone Projects, or participate in day hikes in the surrounding peaks. Not forgetting Thanksgiving back home, we make sure to take the afternoon off to celebrate this delicious holiday with a special local feast as we give thanks for all the incredible opportunities we’ve shared thus far. 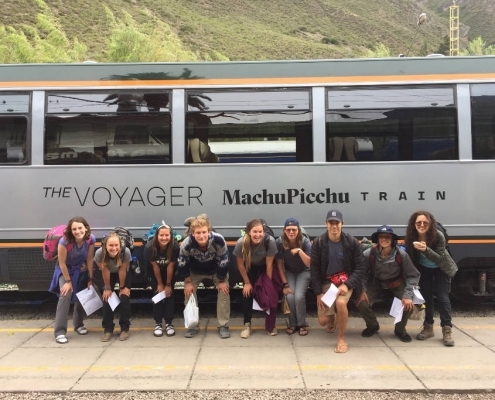 Meeting back up with our local guide, we travel by train to the sacred Incan city of Machu Picchu, the “Gate of the Sun.” After spending a night in the town of Aguas Calientes, we enjoy a tour of the sacred temples, plazas and ceremonial baths of Machu Picchu. We hike up Huayna Picchu (Young Peak) to catch a birds-eye view of Machu Picchu, which is one of the Seven Wonders of the World. 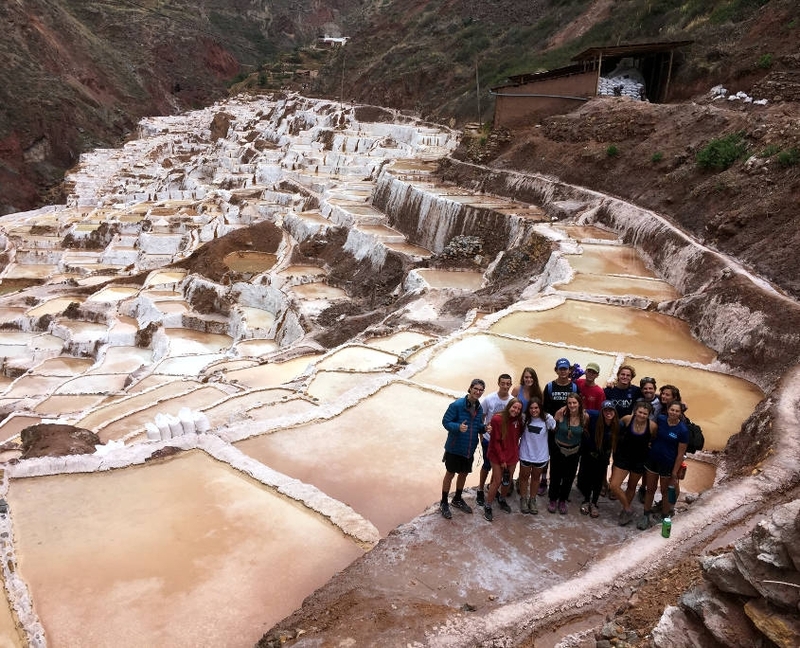 Loaded with photos from Machu Picchu, we travel high into the heart of the Sacred Valley to a rural community located on the plains of the Pampa de Anta region. 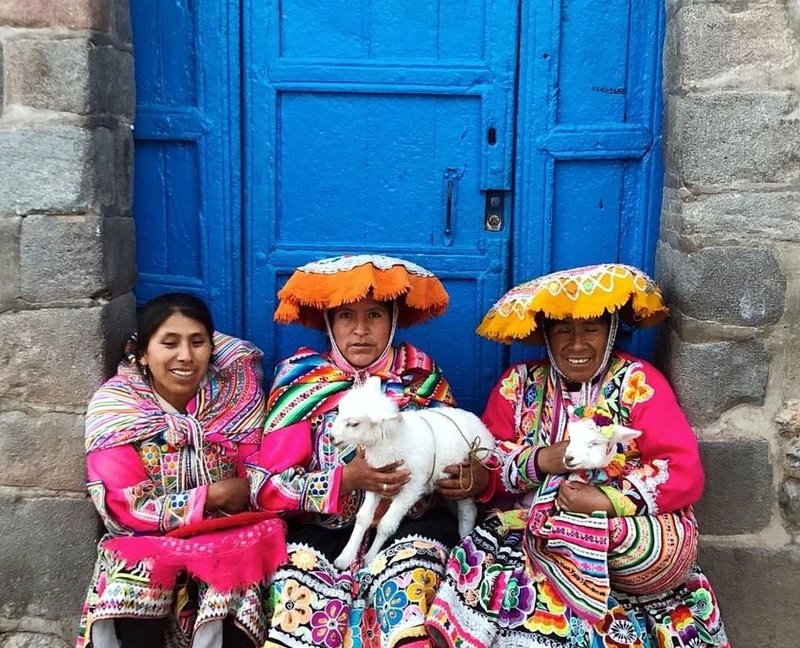 Surrounded by awe-inspiring, glacier-capped mountains, the village is home to 50 Quechua families who live off the land, dedicating themselves to farming, sheep and cattle herding, and cultivating native crops. 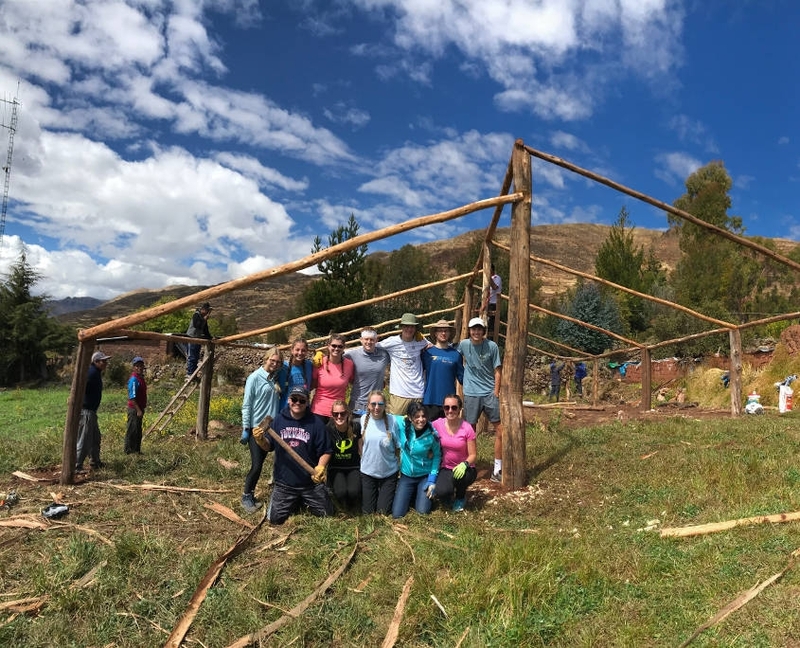 We roll up our sleeves to help community members build guinea pig breeding pens, which serve as a source of income and a way for local women to obtain economic independence. We work directly with families to build these structures and help to provide an income and opportunity for economic empowerment, especially to the women of the community who often are unable to produce their own income. To conclude the construction project we donate a pair of guinea pigs for breeding to each family, which they can then turn and sell the offspring at the local market for a substantial income. 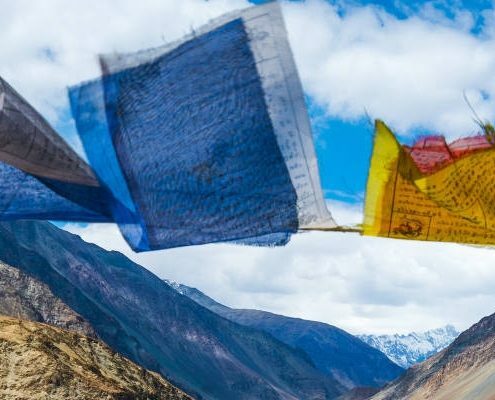 In unstructured time we bond with our gracious hosts and newfound friends as we swim in the lake and venture into the surrounding hills for some stunning hikes. 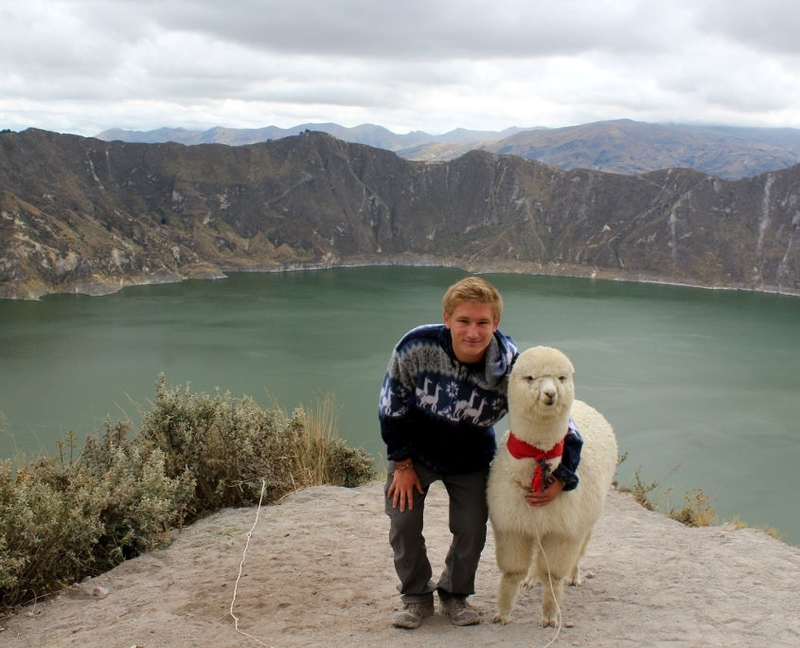 The last section of our trip takes us to Lake Titicaca, the largest high-altitude lake in the world. 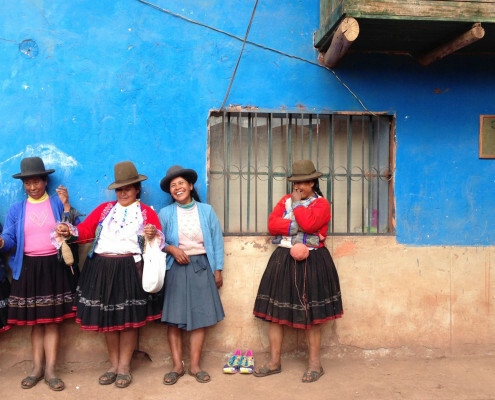 We take a boat-ride out to the floating islands, home to the pre-Incan Uros people. The Uros have made their homes on forty-two floating islands, maintained using bundles of dried totora reeds. We learn about their unique lifestyle on the lake before continuing on to visit Taquile Island. 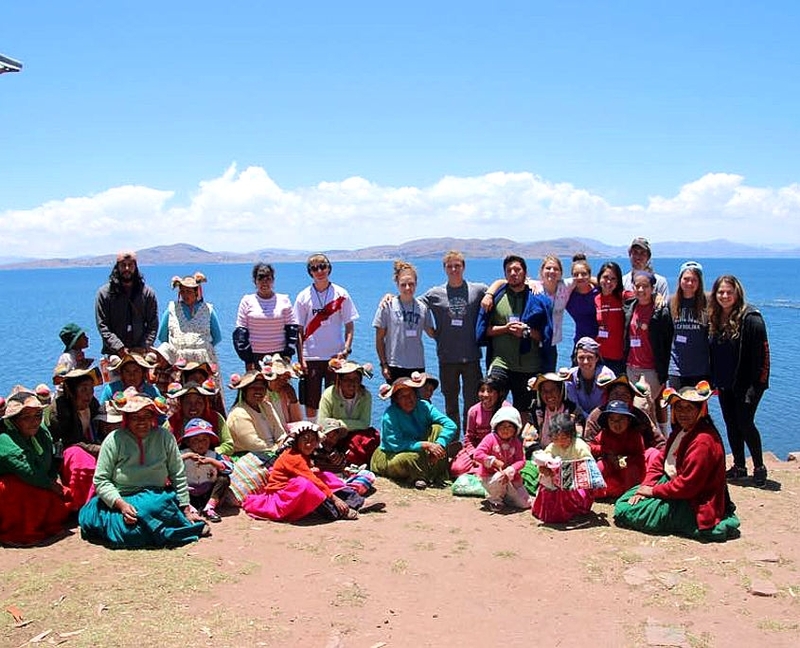 We witness the men knitting for their families and learn more about the unique island life of Lake Titicaca. Upon arrival back to the mainland, we are welcomed by our host families in a village on the shores of the lake. We spend our days immersing ourselves in the lives of the community and digging deeper into public health issues facing the region. We meet with mothers in their homes and discuss the challenges in providing healthy meals for their families. 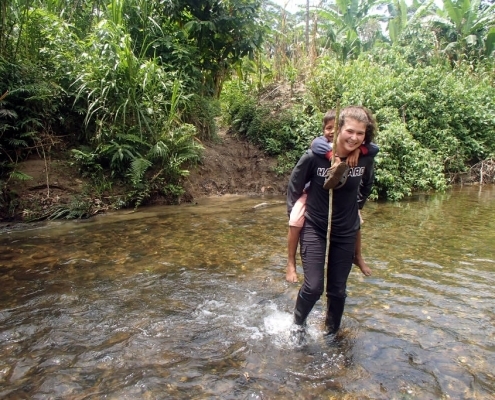 We investigate why malnutrition is such a severe problem in rural communities in the area and partner with a local nutritionist to educate the community about healthy nutrition. During the second part of our service project, we help build individual gardens for families to plant seeds to grow vegetables, in turn providing them with a more well-rounded diet. In down time we may explore the lakeside area, play soccer with the local children or swim in the lake. We spend our last days together as a group in this picturesque setting. Our experiences during these three months will stay with us for the rest of our lives. As we savor our remaining time together, we are excited to head home to share our newly gained knowledge and insights from our firsthand look at the global issues facing Costa Rica, Peru, Ecuador and the Galapagos.